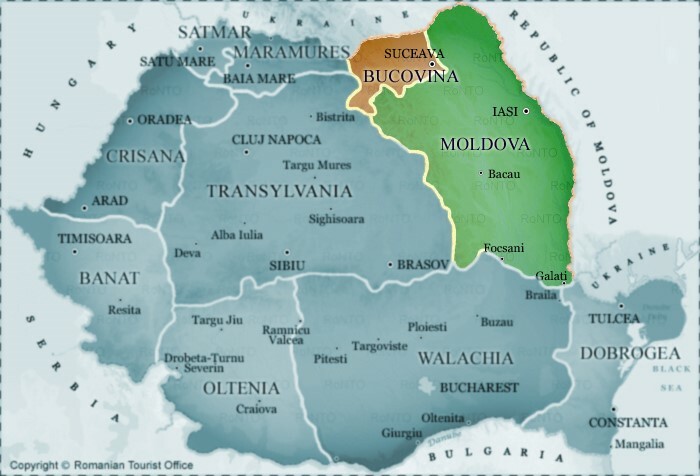 Transylvania, Banat & Crisana, Bucovina & Moldova, Dobrogea, Maramures, Oltenia & Walachia. LOCATION: Moldova region is located in northeastern Romania – between the Carpathian Mountains and the Prut River. Bucovina is situated in the northern part of the region of Moldova, bordering with Ukraine. Note: The region of Moldova (often referred to in the Western press as Moldavia) is not to be confused with the Republic of Moldova, its eastern neighbor. CLIMATE: Temperate continental with hot summers and cold, snowy winters.